The most dangerous part of football—tackling—involves some of the sport’s most forceful impacts. As the speed of the game, and its athletes, continues to get faster, the force of those impacts also accelerates. So for beginners, learning the technical skills required to limit the danger of getting hit (or hitting) improperly is paramount. Shadowman Sports has a solution to the problem. The most dangerous part of football—tackling—involves some of the sport’s most forceful impacts and greatest opportunities for players to get injured. As the speed of the game, and its athletes, continues to get increase, the force of those impacts also accelerates. So, for athletes who are just starting out in the sport, learning techniques that can prevent getting hit (or hitting) improperly is paramount. And the only real way for players to learn what to do and what not to do in the split second that it takes for a play to develop is to engage in full-speed tackling instruction in a realistic environment. As the need for proper tackling technique increases, Shadowman Sports has set out to fill the void with its solution, one that dozens of big-name NCAA football programs have already embraced. The Ireland-based company has developed a mobile tackling system, the only such system on the market. 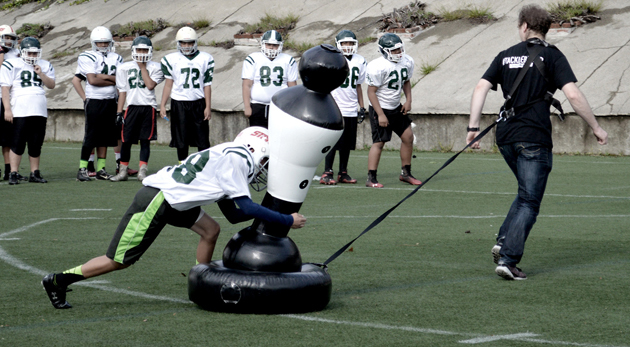 The three-part system includes an inflatable dummy, a slide and a harness, allowing coaches to recreate realistic tackling scenarios. After testing dozen of materials, CEO J.P. Hartigan tells SI.com he selected a PVC with elastic to mimic the feel of a real tackle, complete with spring and cushion. The apparatus, made using air and water, offers a consistent and durable product, Hartigan says. A two-and-a-half-year development process that started when Hartigan was studying design and technology at the University of Limerick included more than 100 prototypes. ​For younger kids learning the game, tackling can prove the most difficult skill to master. “They can practice endlessly on Shadowman and the coach can tweak and get them into the right positions,” Hartigan says. While Shadowman is proud of its recent partnership with USA Football, it has inserted itself into practices at close to 50 Division I NCAA schools across the nation, including Notre Dame, Oregon, Virginia Tech, Texas A&M, Tennessee, Arizona and the University of California, along with hundreds of high schools and smaller NCAA schools. ​“You can’t really simulate live tackling, but Shadowman will be a good tool for our guys to replicate tackling without risking injury to each other,” University of Arizona football coach Rich Rodriguez tells SI.com. “We used it during the spring and we’ll continue to use it this fall. “It’s hard because you’re limited in the number of days you can live tackle, and from a health standpoint you don’t want them beating each other up. With our stretch of 12 straight games, Shadowman really could make a difference for us in practice. While Hartigan has extensive knowledge in the world of rugby and Shadowman has been used there, the company right now remains focused on football. Some coaches use it for punt return practice, with up to five Shadowman dummies moving and requiring evasion from the returner. Other coaches use Shadowman as linemen and with the harness system move them to force either quarterbacks or defensive players to react.